If you just typed in, SEO Barrie, into Google you followed the links and arrived at this page. This undoubtedly proves the power of SEO. Optimizing your websites so you out rank your competition. This sequence of Google input and search results is called Organic Ranking and will continue to produce traffic to your website. It is the best ROI going forward. Traffic to your site equals new customers and new customers increases your income. A brief over view of our client base for you to relate to. The majority of our new clients have tried some form of Online Marketing with their site hoping to increase their Page Rank. They try for a few weeks and give up because they are not seeing results. Their next move is to Google Ads. SEO experts call Google Ads the never ending black hole of payments that leave you with nothing at the end of your campaign accept for a bill. 90% of traffic never click on ads, WHY? How many time have you click and ad and actually found what you want…most of the time you find something relatively close but not really what you searched for. Our web developement team can provide a solution for your business to change your website into a lead generating revenue stream. Google Ads are Google’s money maker. They want more clicks, more clicks more money. It’s not about quality results, its’ about clicks. Google’s parameters for placing their ads in front of users are very loose and that’s why you see ads for Tires when you are looking for Rims. You don’t want Tires you want Rims. However if Google gave you Rims you would immediately stop clicking, but that doesn’t make Google money. You see my point. Don’t get me wrong I use plenty of Google tools but Adwords is the worst ROI for online adverting. Another current trend we am seeing are companies going overseas with their SEO services. If cheap services from oversea are what you are looking for please go right ahead. It will be a hard lesson learned, I do not recommend it. You will soon find out the joys of working with a companies that speak broken English, misinterpret what you are saying, have massive time delays, have the ability to ruin your website in minutes with bad SEO, have no accountability and they will gladly take your money and never be heard from again. As you probably can tell, I am speaking from experiences. Years ago I had some e-commerce work done overseas. One of the worst experiences on by professional career. The result is a total loss of control on your website which is incredibly detrimental to your SEO success. Search Engine Optimization Firm Barrie. Our SEO strategy is simple and effective. 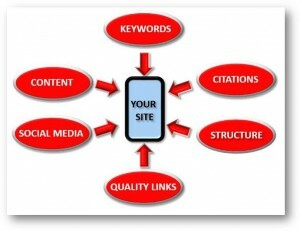 The image below is a flow chart of the On Site optimization that we provide. The Off Site optimization is a trade secret. Our systems are deriveted from many years of researching the GOogle Patnets and algorythm updates, such as Hummingbird, Panda and Penguin. We are Google Certified experts and can bring you targeted traffic to your site. Defining your core groups of words/ keyword phrases is the most important step and everyone always skips this step. Keyword Research is the number one key to success. Without the proper SEO foundation all your Online advertising efforts will be in vain. One you have your Keyword phrase that correctly define your business and targets market, you can move onto your On-Page SEO. There are several steps to properly present your content to the end users and to the Search Robots. Your meta info must be correct. Your Images and alt tags will help your case. Your File Structure should be very clean and properly established to allow for quick understandable access to your site for humans and robots. Once all your On-Page items are correct the next step is the social engagement. You will find us ranking for other locations like Search engine marketing Newmarket or other cities across Ontario, proving the SEO works. Utilizing Social Media has becoming one of the highest ranking factors and effect marketing strategy in the last few years. Social activity to your website proves that you are a real business that engages their audience or market. One saying that has always stuck out in my mind is “Tweet thy self”. Never send people away from your site or social media with other peoples content or links especially links to websites that are your competition. Every referring link to your site counts as a positive ranking referral from a high authority website and page rank. Page rank was created by Larry Page over a decade ago and is still a ranking factor today. Once you have set up your social media sites you want to incorporate a automated system to promote your blog/feed content to your social media sites. This all in one syndication system will let you automatically post to your social media sites with one click, This system is a huge time saver and is a big seller with our clients. If you are outside of Barrie and need Website designer in Collingwood click the link for other areas we serve across Ontario. If you want to more leads thru web traffic contact the experts and let us help you increase your sales and reach more people thru the web search engines. Contact us at sales@vywebdesign.com and let the Barrie SEO experts get your website ranking!